BUT READ IT QUICKLY BEFORE IT'S A PUDDLE. The Tokositna Glacier, on the south side of Alaska's Mount Huntington, has begun to surge down the mountain with loud rumblings and snapping sounds as the ice moves and breaks. In late February, 2001 pilots flying in the Alaska Range began to notice unusual activity on the glacier. By mid-March dramatic changes in the glacier and its crevasses showed that it was surging. This sudden movement surprised researchers who had been watching for signs of movement on another glacier. The Tokositna has undergone smaller surges in the past, but none have been noted that involve the majority of the glacier like this one. 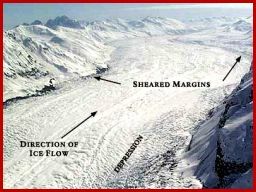 Finding the reason for a glacier surge (such as climate change or earthquakes) is very difficult, but in this case the surges are thought to be caused by the buildup of melting water beneath the glacier. Search for more on this topic ... from ATHROPOLIS!